Where there are images available, links have been provided. 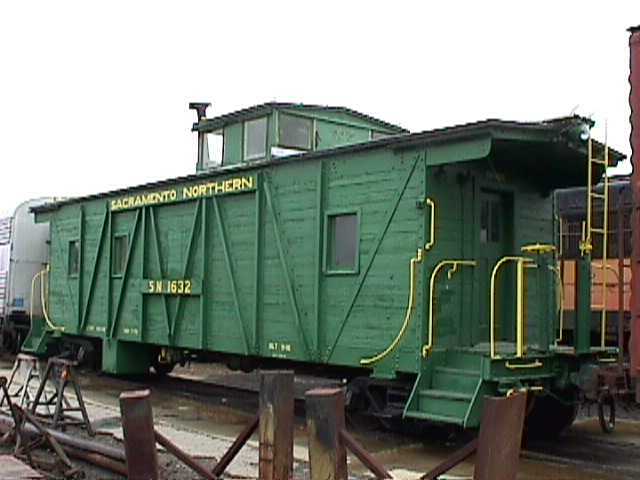 If you have a photo of a captive WP caboose that I can use, please let me know. Cabeese that were once owned by WP but later operated by SN are shown in this table under their SN number. This list was compiled by Roger Kirkpatrick, the net's guru of surviving cabeese. Any additions should be sent to me with a CC: to Roger. 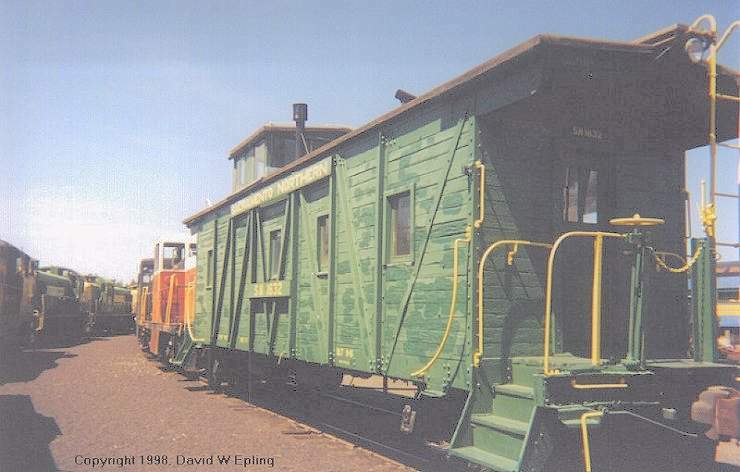 A note on some of the images: The links for cabooses in the Portola RR Museum collection are displayed on two sites, Frank Brehm's, indicated by a (B), and Sam Herschbien's, indicated by an (H). WP 446 Westwood CA Gift Shop, FOR SALE? WP 456 Cherokee CA LOCATION? WP 465 Rocklin CA Steel, bay window. 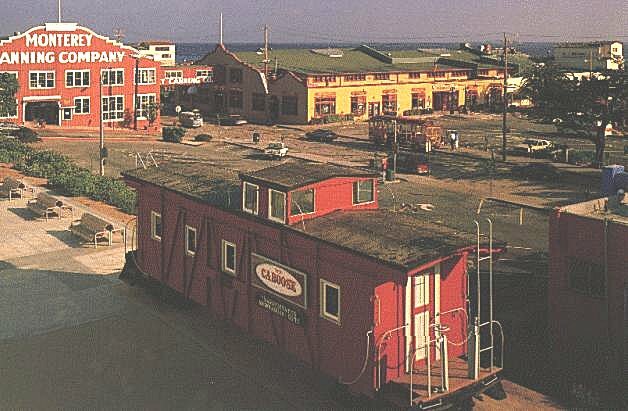 In the "back yard" of a mini-shipping square consisting of railroad cars (note the WP boxcar behind the caboose). Thanks to Bob Milloy for the photo and info. WP 477(B) Redwood Valley CA Steel, bay window. 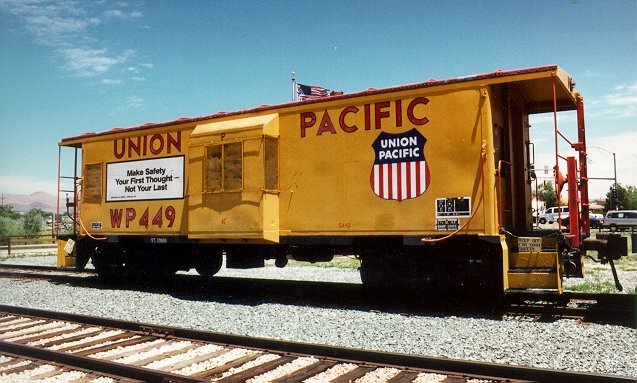 WP 649 Salinas CA Sam Jenkinson, LOCATION? 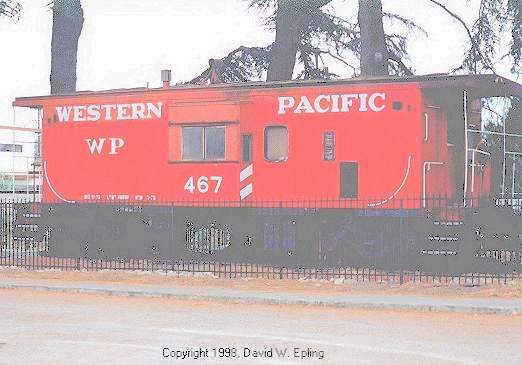 WP 670 Jamestown CA Sierra Railway? WP 675 Los Altos CA Southern Pacific Depot, 1st & Main. Now a part of an antique store. WP 741 Rio Vista Jct. CA as CCT 19, H&B blt. 1910, Western Railway Museum. Los Angeles CA Wood, H&B, blt 1910; Travel Town Museum, Griffith Park. WP 770 Wadsworth NV Private, LOCATION? WP 1913 Tilton NH Freight House. 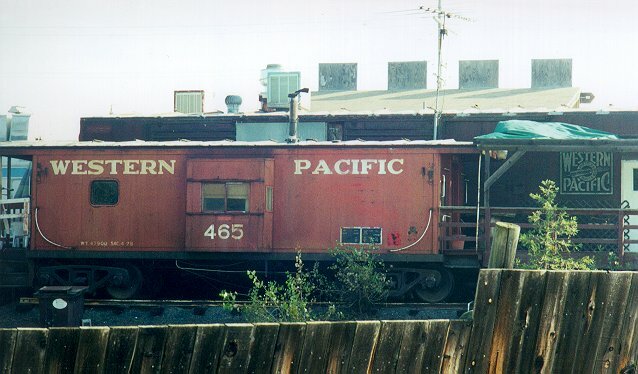 This is not a real WP caboose, but is painted up as one. SN ??? Jamestown, CA Wood, bay window. At Railtown 1897. SN ??? Coyote CA South of San Jose. Was there about 8 years ago, had been for sale. Possibly scrapped. Any info? SN 1611 Camino? CA Camino Cable & Northern, GONE TO? SN 1639 Moss Landing CA ex-WP 618; wood, cupola; Moss Landing Road. Reports are that this one has been moved. Can anyone confirm? TS ??? Santa Cruz CA Supposedly part of restaurant ex-SP depot. 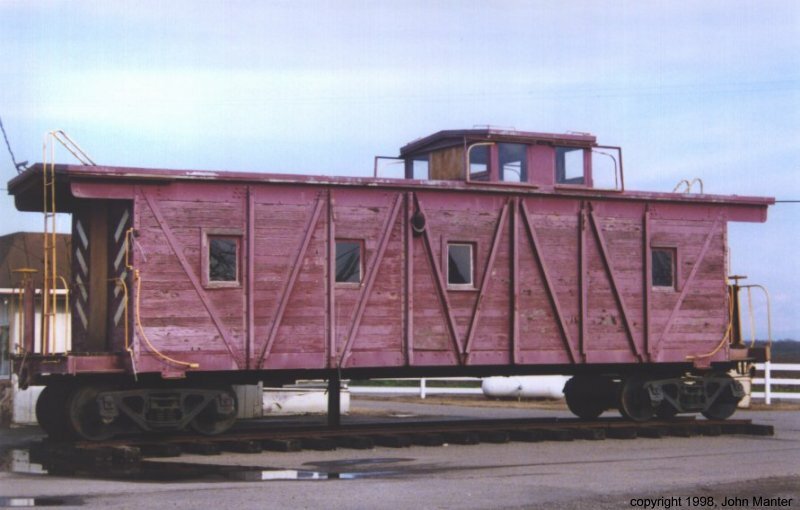 A recent fire completely destroyed this caboose. Both the caboose and the depot are now gone. TS 307 Oakland CA Wood, outside braced, cupola; Corner of 5th Street and Embarcadero. Behind fence but can be seen from street. 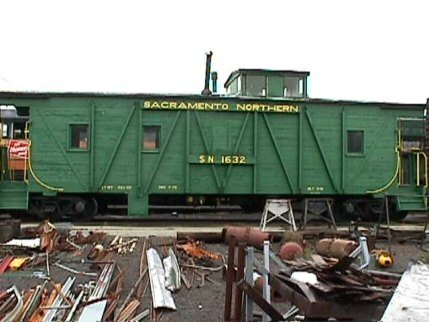 TS 308 Modesto CA Wood, O.B., cupola, ex-boxcar 15458, ex-WP 623, to TS 6/58. Sold in 1959 and used as a Coffee House. 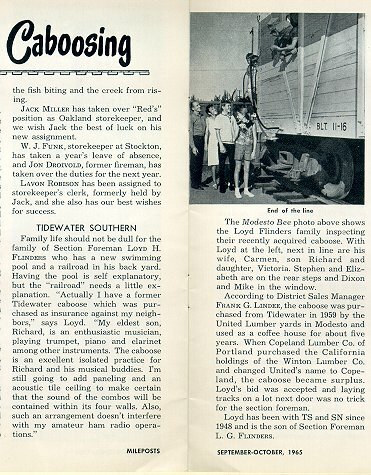 Sold in 1965 to TS Section Foreman Loyd Flinders, and an article on it appeared in WP's Mileposts. On its status today, Ryan Barber writes: "Owned by Thomas Rettig, co-owner of Rettig Bros. Machine Shop in Modesto. It is located on his home property in the country outside of Modesto. Interior has been converted to a guest room and the exterior painted a bright red but with accurate yellow lettering."